Red-skinned sugar cane is often boiled to obtain a semi-sweet sugar cane stock. It is a delicious drink on hot, sweaty days and helps cool us down. Try these recipes and enjoy. Clean and cut sugar cane into sections, then halves. 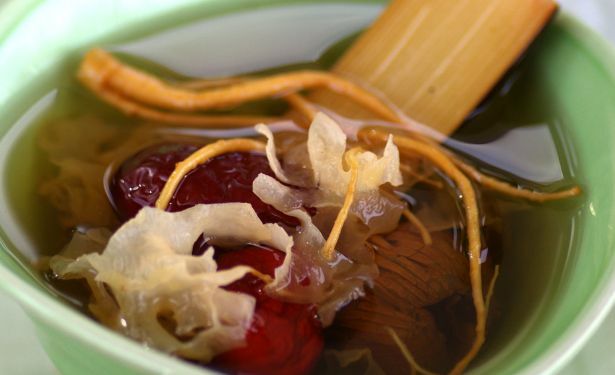 Rinse and soak hairs of ginseng roots for 10-15 minutes. Drain and set aside. Bring water to a boil in a deep saucepan. Add all the ingredients and boil. Reduce the heat, cover the pot partially and allow to simmer for about 45-50 minutes. Serve up the soup hot or when it has cooled down.